I had the pleasure of spending the last weekend of October discovering some of the amazing, smaller wineries to be found in the Castilla La Mancha region, the biggest wine region in Spain and perhaps the least known or least appreciated as a producer of quality wines. They do produce many excellent wines here although the majority of the wineries struggle to compete in the national market in Spain. My trip started in Madrid from where I took the high speed train to Ciudad Real. Remarkably it´s only 40 minutes to get there and well worth keeping in mind as another ideal daytrip or overnight stay from Madrid. The first winery I went to see was Pago del Vicario near Ciudad Real. In fact I stayed here as they have attached to the winery a lovely 4 star hotel, very modern and chic. The winery´s restaurant was terrific too, one side of it being a glass wall with pleasant views of the interior of this modern bodega. I didn´t get a chance to try the pool but it did look inviting. In summer they have live music and dining outdoors. A great modern approach by this winery looking to open it´s doors to the world. I´d recommend staying here for a night, perhaps en route from Madrid to Cordoba. You won´t be disappointed. And the wine, simply wonderful. Next I went to see the Dionisos winery in Valdepeñas. This was an incredible experience. Known as the Winery of the Stars this family winery dates back to the early 19th century and practises biological farming. All the decisions regarding the cultivation of grapes, harvesting, etc are taken based on the stars, the cosmic rhythms and lunar cycle. Inside the winery they even have an inflatable globe large enough for 12 or more people to sit inside and contemplate the universe which they have projected on the walls of the globe. The wines produced here have won a number of awards. I highly recommend visiting Dionisos. It´s unique. 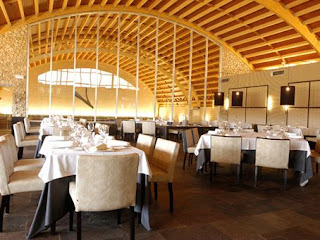 I next went to see the Bodegas Real another marvellous modern winery with an excellent restaurant where I enjoyed lunch. Here too they are planning to build a hotel which will make this a very attractive place to stay. 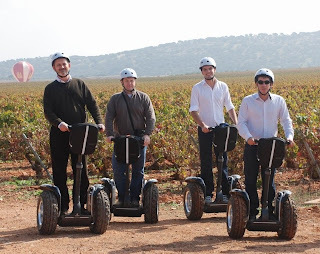 While at this winery I had the opportunity to enjoy some additional activities including a flight in a hot air balloon followed by a very unique guided tour through the vineyards on segways. Great fun. My next stop was at Bodegas Castiblanque another family run winery but what a winery. It was a pleasure to visit. 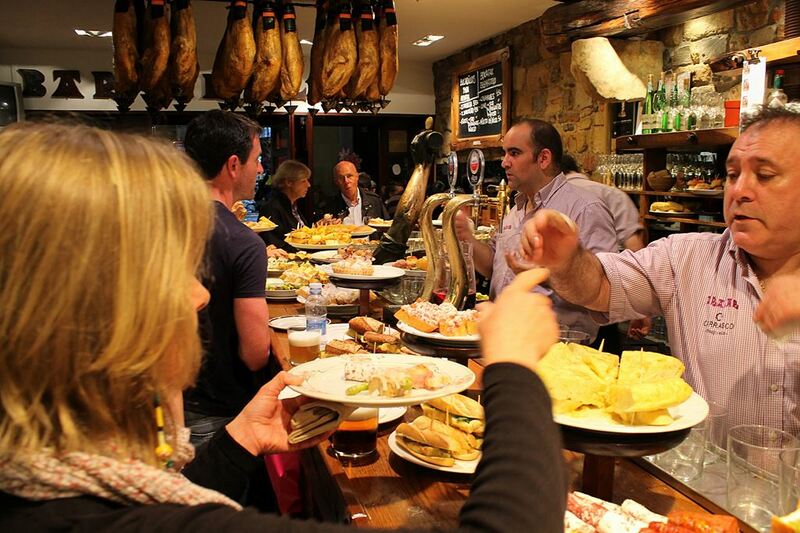 The people here eat, drink and sleep the world of wines. They have even started courses in wine appreciation for children. Before getting concerned, they do this with the non-alcoholic grape juice known as mosto. The children really enjoy themselves and get a chance to experience the workings of a tradional winery. 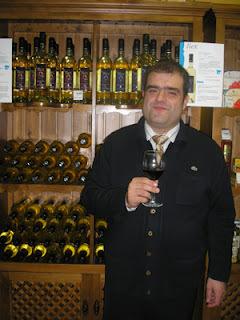 I loved this very welcoming winery and our host while there, Miguel Angel Castiblanque, was charm personified. Later I was delighted to discover that on the outskirts of the town where this winery is located, Campo de Criptana, you can visit the famous white windmills made so famous by Cervantes in Don Quixote. Miguel Angel informed me about this and took me for a trip up to see them. My last stop on this whirlwind tour was in Toledo at the Viñedo Cigarral Santa Maria situated in an unforgettable location in the hills above Toledo. This small yet impressive winery is owned by Adolfo Muñoz, a famous restaurateur who has a string of successful businesses to his name including a fine 5 star hotel. They produce just 4500 bottles of wine a year here but each bottle is much sought after. I enjoyed an incredible lunch here while soaking up the views of Toledo city. Later I took the high speed train from Toledo to Madrid which now only takes 30 minutes.